Tomatoville® Gardening Forums Index > What Else Do You Grow? > Miscellaneous Edibles > Alliums > Where do you buy your seed garlic? My first crop ever was planted Fall '16 with garlic bought from The Garlic Store in Ft. Collins, CO. They have seven different Sampler Packs for various areas of the country so I got the one for Southern states/mild climate areas. You pick any four different bulbs from a list of nine different varieties for $14.95. After reading about each one elsewhere online, I chose Maiskij, Shilla, Spanish Benitee and Blanco Piacenza. The first two did great, the last two not well at all. I'm still growing the first two (hardneck turban types), having replanted each fall from the prior crop. They make nice fat bulbs. The Garlic Store shipped fast, had great quality bulbs and being a garlic newbie, I really appreciated the growing instructions on their site. lives in the next cup-de-sac over. We will split it. It is expensive to order garlic. I went ahead and ordered from Territorial Seed Co.
we’re limited. I ordered Susanville & Silver white. After harvesting that fall '16 planting, I don't believe I ate any (well, maybe one bulb) and saved them to replant fall '17. That was 36' and yielded 95 bulbs this May so I've replanted the same amount, sliced/dehydrated enough for a year's worth of garlic powder, used a lot fresh and still have 35 bulbs left to last until May's harvest. I sure don't want to have to buy more! What I've got grows and tastes fine so I'm not looking to try anything else. I save the best ones to replant the next year. I didn’t have any, so had to buy some. My garlic seed just arrived. Expertly packaged and labeled. Gorgeous and blemish free. Clean, wrapped in newsprint, then the local funny pages. Love the basic labeling including the variety and its history. I had planned to at least double my harvest but seems we will triple it. Nearly all of my garlic is from the Seed Savers Exchange, both from their commercial catalog, and from their Yearbook listings. This is all replacement stock for varieties I lost last year, when the property where I grew my garlic was sold without warning... lost all but 4 of the 35+ varieties I had been growing. 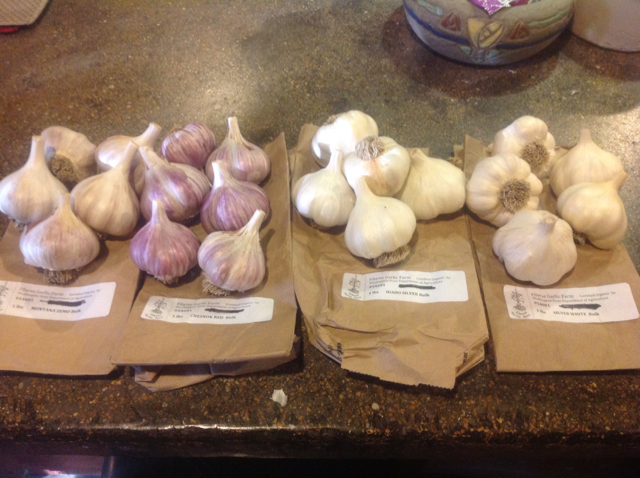 The Yearbook garlic just arrived last week - very large impressive bulbs this year, I hope mine turn out half as well. Now if it would just quit raining, maybe my garden would dry out enough for me to plant them! Been raining off & on for several days, it will be a week of rain before the weather pattern changes. No worries yet, as long as we get a dry spell before the end of October. Just checked, all of the garlic listed on SSE's website is sold out for the season. Nearly all of my garlic is from the Seed Savers Exchange, both from their commercial catalog, and from their Yearbook listings. This is all replacement stock for varieties I lost last year, when the property where I grew my garlic was sold without warning... lost all but 4 of the 35+ varieties I had been growing. Surely the new owners could have allowed you time for your crop to mature and return to harvest it? Did they put the ground to immediate use? How heartbreaking. It was not quite as bad as that. The crop did mature & was harvested. At the time of harvest, I had not recently been in contact with the owners. They were long-time friends, but had not told us of their pending divorce, or of the sale of their land; so I had prepped the ground, and planned on re-planting. It was already October when I learned the land had been sold, too late for me to locate another plot of that size. I squeezed as much as I could into one of my home plots, but many varieties could not be planted, and were consumed. Furthermore, because that plot was poorly drained & the garlic was planted late (in November) more than half of the varieties planted did not survive. This is the second time I have lost all or most of my garlic collection. As a gardener, you learn to accept that there will be failures... but unlike seed crops, garlic stock is expensive to replace. I have re-acquired most of my favorite varieties (for the third time); but if I am unable to plant in time, or suffer severe losses prior to harvest, then I will be forced to give up on garlic. I also ordered two from Filaree Farm. Chesonok Red hardneck and Sicillian Silver softneck. And I ordered shallots and perennial onions from Southern Seed Exposure. I wanted New York or Polish White softneck and Extra Hardy German hardneck too, but the places I ordered from were out or didn't carry it and I didn't want to pay another $10-15 shipping from somewhere else. I have those on the list for next year instead. It's all being planted this weekend. When I break up my german extra hardy for planting next week I can send you a few cloves to get you started. PM me your address. Hi Oakley! I saw your post and that it's from Hood River....I have relatives that live in Mosier! Planted 200 cloves today (100 softnecks and 100 hardnecks) of saved cloves. Hopefully get these in tomorrow. This may turn into a really funny joke...or not. Nice looking seed bulbs! Looks like you may get about 200 head from those, if so he would get 100 bulbs for the $93, close to a buck a bulb or $5 a pound at 5 bulbs per lb. Don't know how that compares with market prices in your area. You're going to have a great bunch of seed after this year though! !